Trust is the foundation of AfricaOracle. We are truthful, transparent, open and caring. We respect others and celebrate diversity. We are ambassadors for our organisation, country of residence and countries of heritage. Integrity is the lifeblood of our organisation. We are fair, have strong moral principals and act with honesty and authenticity. We collaborate and co-create by leveraging skills, knowledge and experience, connecting people and building networks, enabling others and initiatives to move forward and businesses to grow. When we do, great things happen. We take pride in serving needs, delivering quality and creating value. As an organisation, AfricaOracle fosters a culture based on our core values that acts as guiding principles that shapes and influences how what we do and don’t do. We cultivate a culture of trust in terms of our character and by demonstrating competence through how we work both within our organisation with others. People often ask why Joyce decided to call her company AfricaOracle. Well, our founder Joyce went on a trip to Ghana back in 2007. Ghana had just discovered oil and there was a buzz in the country that she hadn’t experienced in a long time. The ghost port of Takoradi, the closest city to the oil fields and also happened to be Joyce’s ‘home town’ had awoken from its slumber. The holiday gave her a sense of optimism and renewed hope for the future. As Joyce was departing from Kotoka International Airport in Accra (Ghana’s capital), there were numerous flights landing and taking off, the likes of which she had never experienced before. Such was the level of interest and activity in the country. So you can just imagine her surprise and dismay upon landing back at London Heathrow to discover that the narrative about Ghana and indeed Africa remained unchanged. The frustration spurred Joyce on to create a provide a more informed narrative about Africa. In creating the name AfricaOracle, I considered that fact that I am African by heritage, and that the word ‘oracle’ has a long and rich history in African folklore. Combining Africa and Oracle created a name that illustrated this connection whilst at the same time, conveyed the ambitions and vision I have for the company as one that will contribute to the building of the image of a “New Africa” that promotes and showcases Africa and its diaspora, as well, which provides an informed narrative on Africa. The name AfricaOracle was adopted. The rest is history. Joyce is an entrepreneur with over 20 years of business, IT, consultancy, project management experience working in the FTSE 100 firms in the private and public sectors and premises/ facilities management. 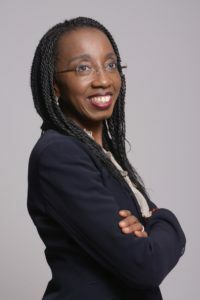 As founder of AfricaOracle, Joyce brings her strategic and project management expertise to work for clients. Her proven progressive leadership, which enables us to lead, guide and support initiatives and make change happen.